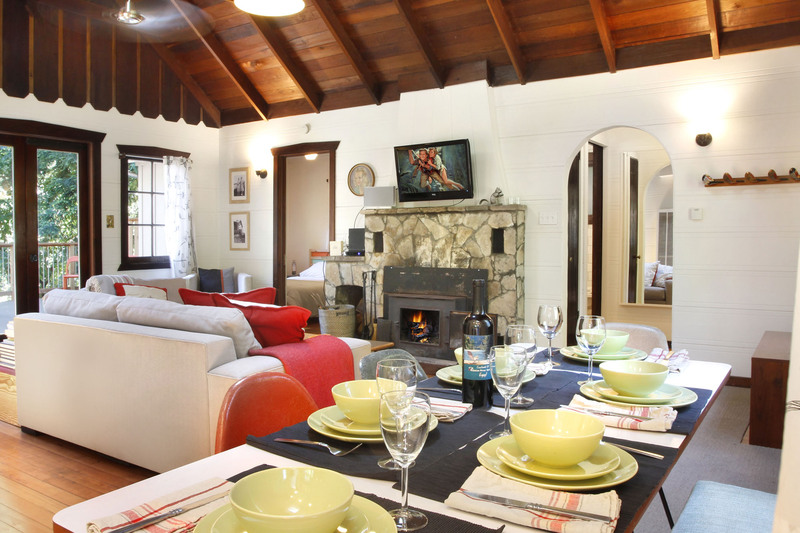 Rumour Has It Marilyn Monroe & Joe Dimaggio spent some quality time in this Adorable Historic Cottage, Enjoying the Easy Walk to Downtown Guerneville and Riverlands Pier, Large Rear Yard, Firepit, Outdoor Dining, Fireplace, and You Can Too! Wi-Fi; Landline Phone; Cable TV. Your Well-Behaved Small Dog is Welcome! Up a set of stairs, to one side of the central living room, there's a dining set, remodeled kitchen, and one bedroom that has its own door to the rear deck. On the other side of the living room, there are two bedrooms and the bathroom. The living room also opens to a gated rear deck with outdoor dining. There are stairs to the mostly wooded rear yard, which has a patio with firepit. House is approx. 950sf; grounds are approx. 1/3 of an acre. Ceiling Fan (living room). No A/C. "This place is small and cozy"
This place is small and cozy with a big welcoming outdoor space. It is quiet and you can walk to town in about 5 minutes to eat, drink or go to the river. This was our second time and we will continue to come back every year. "Wonderful getaway, amazing ambiance, perfect location"
Don't miss. This property is very well cared for and updated perfectly to maintain the vintage details while making it very comfortable with modern amenities. We will definitely rebook when our travels permit. 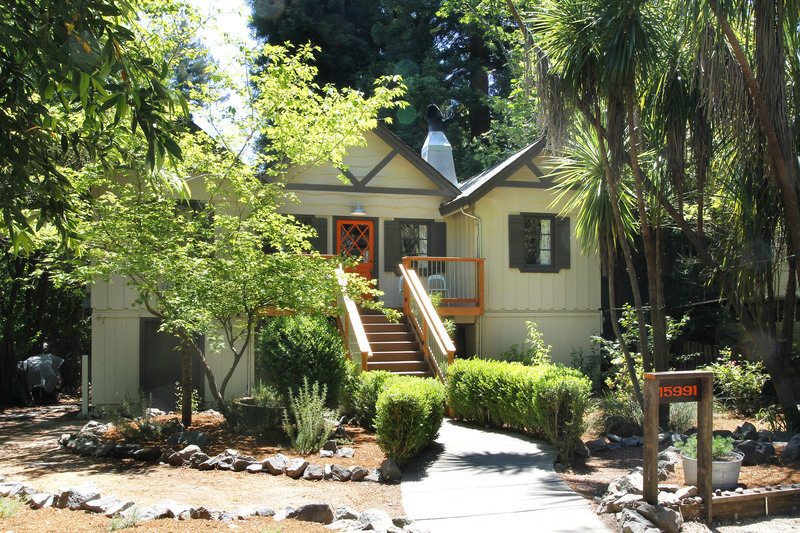 Easy walk to downtown Guerneville, river activities and a short drive from some amazing wineries. The house was perfection. I wish I could live in it forever. It had everything we could have possibly needed - down to the yoga mats! It was stylish yet comfortable and was a great location. We walked into town each morning for coffee and a couple times for dinner as well. The back patio was absolutely awesome for al fresco dining after days of wine tasting. We only saw the neighbors once with a quick wave. Felt very private even though it was in a residential area. Management group was super accommodating when we needed to change our dates a few months out. Would recommend to anyone heading that way! 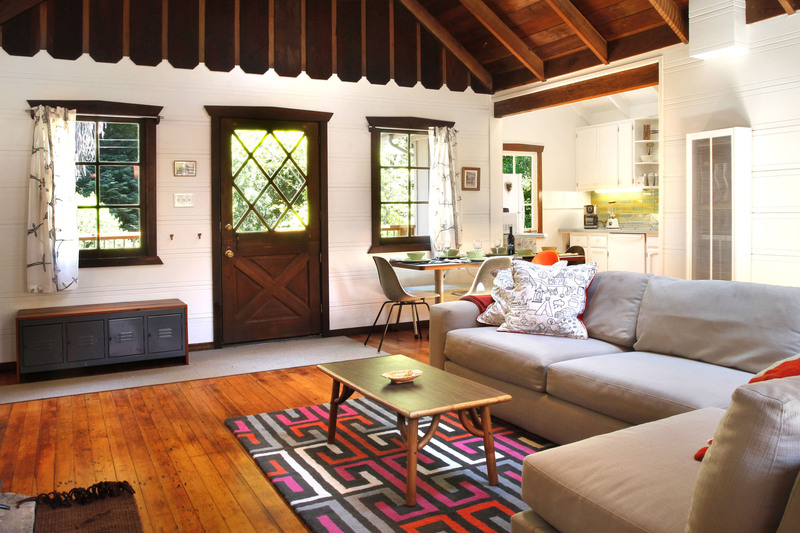 "Woodsy Cottage Steps from the Russian River"
Nicely appointed three bedroom, one bath, cottage - perfect for a party of 6. Kitchen was very well equipped, beds comfortable. Only issue was the no show cleaners before our arrival, which meant spending our first two hours watching the sub team tidy up. "Fantastic house for a group of couples"
Fantastic house for a group of couples. We rented this house with a group of friends and everyone had a great time. 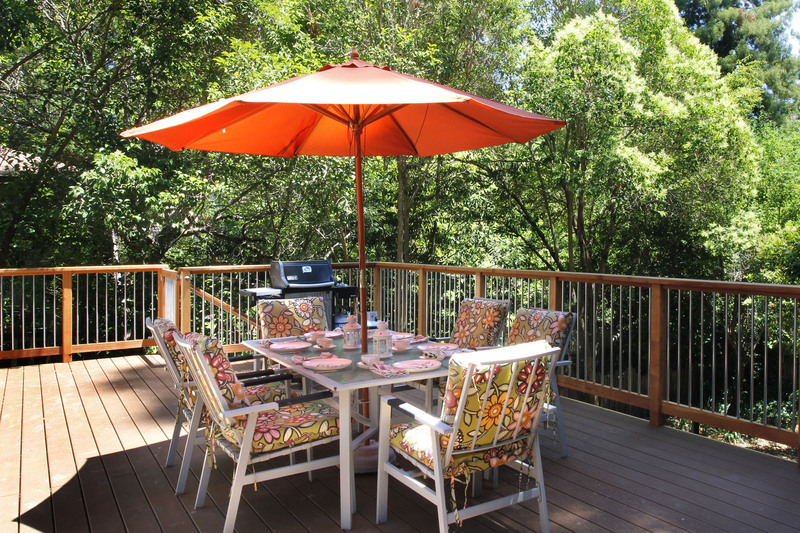 The location is so nice because you can easily walk over the gorgeous footbridge to downtown Guerneville. The house is in a nice neighborhood, easy parking and has a great yard and fire pit. The only down side is that the mattresses are a bit uncomfortable/mushy. Other than that, I highly recommend. "My family loved this house!" We had a wonderful stay in this peaceful home! The house was stocked with everything we could think of (kitchen items, linens, etc.) and well located to access so much of Sonoma County. Highly recommended! "My family had the best time here! " My family had the best time here! It was a great house and well equipped with everything we needed! We used to go up to the Russian River as kids, and it was awesome to share our nostalgia and memories with a new generation. The House was the perfect size for 3 adults and 2 kids (and our pup!) with room to spare. Very close to the beach and downtown! Definitely plan on staying here again in the future! "What a great space! " What a great space! 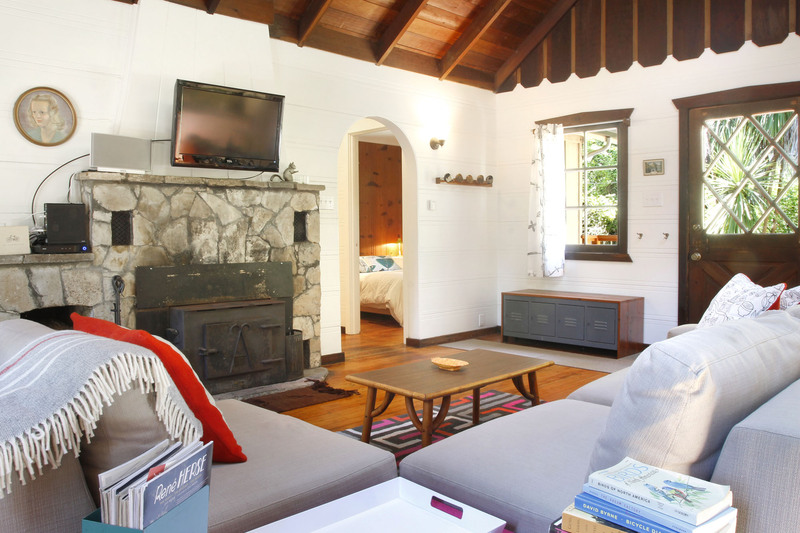 We loved the fireplace, the central big living room, and the easy access to town. "We loved our short stay here"
We loved our short stay here. It's a well thought out space with everything you need. Furniture and decor are tasteful and cozy. We had a great stay and would always come back. The house has plenty of space, cute furniture and a very nice patio. "This was a great rental"
This was a great rental, in a nice location. 3 good bedrooms and a lovely open kitchen/dining/living space. We especially enjoyed the back yard, lots of space, a large deck and bbq, and downstairs a fire pit (need to provide your own wood) that the kids loved. We are not dog people but the rental is dog-friendly, and I was relieved to find it wasn't completely covered in dog hair, nor did it smell terribly of dog. Close to town and the river, the home is nicely tucked away though we did experience some noise, a dehumidifier that is quite noisy in the front bedroom, and neighbors playing music until midnight, fortunately none of it was loud enough to disturb our sleep. Key pick-up and drop-off was quick and easy, and the one bathroom was clean and well stocked. We didn't cook during our stay but the kitchen had most of the basic items. We would stay here again. What a great place! Perfect for our group visiting for Sonoma County Barrel Tasting. The Cabin was clean and very comfortable. We cooked several meals and had a great time! Will definitely be back next year! Thank you Russian River Resorts! We loved our stay! The home is charming, the beds are comfortable and it’s an easy, scenic walk into town. "This is a wonderful cottage in a beautiful place"
This is a wonderful cottage in a beautiful place, with charming decoration, impeccably clean and organized, comfortable amenities including a fireplace and outside barbecue. Highly recommended for a stay in Sonoma. Very comfortable and stylish. Even better in person than in the photos. We had everything we needed and more! I would definitely stay here again, and would recommend for anyone traveling to this area. "Beautiful, clean home in a great location"
Beautiful, clean home in a great location. We were very pleased and satisfied with our stay. Cozy and clean! It was the perfect first getaway with our newborn. And our toddler loved the backyard and the park nearby. Would love to come back. Thank you! this is a lovely cosy space with a lived-in feel. A perfect location for our family Christmas holiday. My family (husband and 4 young adults) and I really loved this home from the thoughtful and modern touches to the location, beautiful surrounding trees. The kitchen (esp.) was very well equipped for the breakfasts and special dinner we chose to make there—very ideal for this family time. River Getaways was on top of my questions and requests, our stay was truly so comfortable. We would stay here if the opportunity comes again, no doubt! "Rumour Has It was a fantastic experienc"
Rumour Has It was a fantastic experience and would definitely go back. Starting from self check-in being a breeze. The moment you enter the house, you feel like you are in an old cabin in the redwoods, except the place has been beautifully updated and maintained. Modern, full kitchen to be able to cook for a group of 4-6 with ease. The deck on the back of the house with a grill was great to use. Even heading into winter, it was comfortable to cook and chat outside! 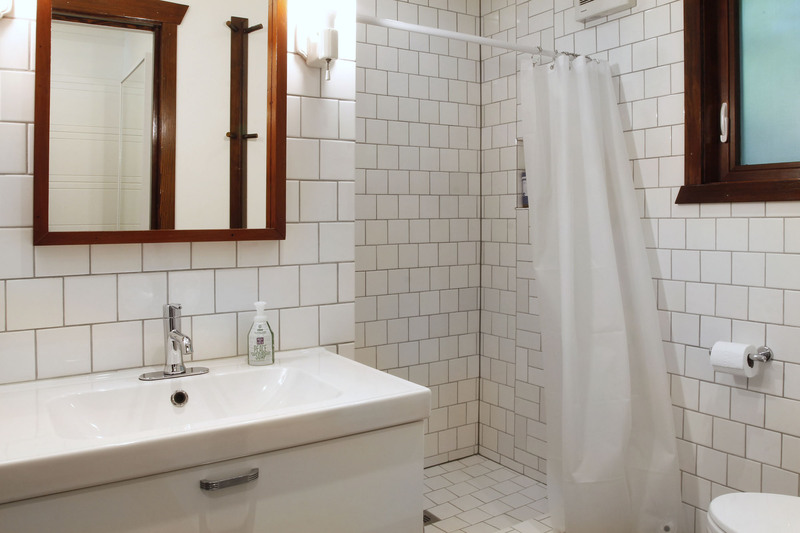 Bathroom is fully updated, but still has a rustic charm! Phone, Internet and cable TV was nice if raining out. 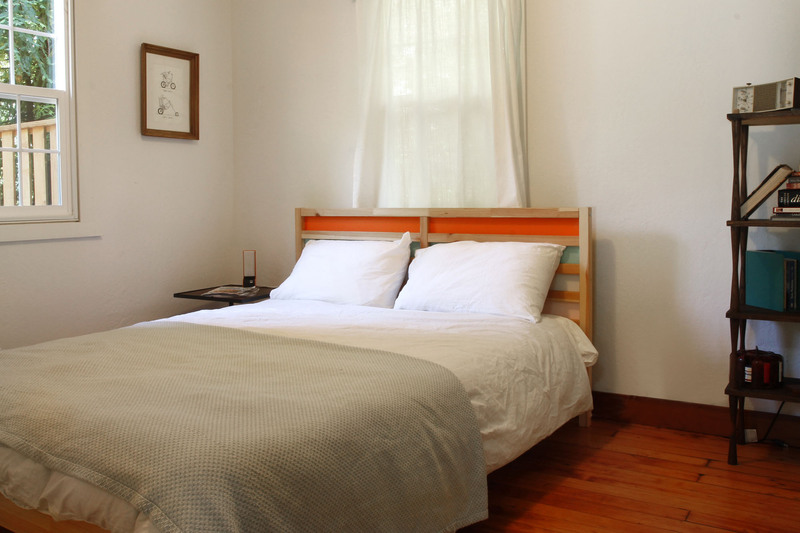 The 3 bedrooms can easily fit 2 adults each with comfy full beds and extra comforters for those cold nights. If cold at night, main area has a full heater and each room has a floor heater which was more than enough! The guidebook was great for an introduction to things to do in Guerneville. Close to nature, vineyards, 30 minutes from coast and 30 minutes from Santa Rosa! Washer and dryer were on-site for use and we're happy to start the load of towels before we left! Beautiful house in the perfect setting! If you are looking for a restful, fully stocked and comfortable place, this is it! A short walk from Main Street, across bridge. Area was super safe and home was very clean. Kitchen was ready to prepare any type of meal. Fireplace took a minute to get figure out. Once we did, it was wonderful. (Truly, operator error! LOL!) Definitely on my list to return! "Rumour Has It is such a beautiful property! " Rumour Has It is such a beautiful property! 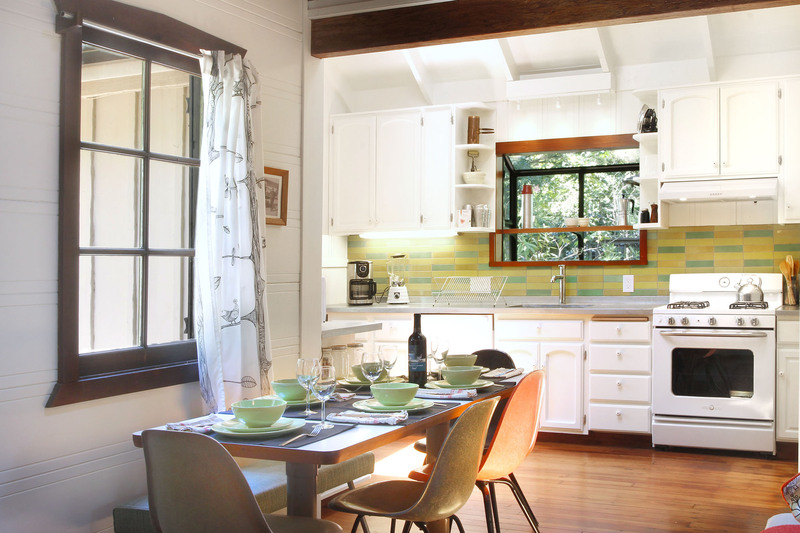 We loved the style of the place and the well-equipped kitchen, perfect for the mellow evenings that we needed after long driving days around the Anderson Valley area. It was also very easy to check in and out, just a quick visit to the office in downtown Guerneville to pick up and drop off keys. Will be recommending this place to friends in the future! "Russian river getaways is Awesome"
Russian river getaways is Awesome! Feels good to book with confidence. The house was amazing felt secluded but able to walk to downtown. We really loved relaxing on the deck. The house had tons of amenities. Will definitely book again! Everything was great! Well...except for the bathroom door that was off it's tracks, but other than that the house was well stocked with pots, pans, dinnerware, coffee makers, etc... The rooms were clean and in good order and the firepit was ready to go. We didn't actually use it but it was a nice idea. Overall a great stay! "This house has a great location..."
This house has a great location and is walking distance to downtown. The house has wonderful living space and a great backyard. The home is tastefully upgraded with modern conveniences while maintaining it's original charm. Bedrooms all had enough room to move around, kitchen was well stocked with necessary items for cooking and the deck was lovely. No formal indoor dining area (there's a table with chairs but due to space it's up against a wall), but it wasn't an issue because it was still warm enough for us to use the patio furniture and enjoy the deck! Very quick drive to town, redwood forest and Johnson's Beach which was convenient! "Great house with nice decor"
Great house with nice decor, pleasant deck, perfectly-sized and -stocked kitchen, and a quiet location. Even better if you have kids because there's a mini-golf course (although we didn't use it) and playground a couple of blocks away. We strolled to downtown Guerneville (10 mins) several nights. Gorgeous area with a good selection of beaches to spend the day at: what's not to love?! "This getaway was absolutely wonderful! " This getaway was absolutely wonderful! It felt secluded in the woods. We didn't take advantage of being so close to the river, but downtown was close and easy to get to. We stayed for a race that was taking place in Santa Rosa, so the 30 min drive wasn't bad to be able to have enough space in the house for my group. Thanks for such a cute place to get away to! This house was clean and comfortable. I loved the design and the backyard and deck were incredible. Good location- walking distance to downtown. Can't wait to go back! "This was a fantastic place"
the cabin is adorable and in a great location but we had the misfortune to stay there during a heatwave. we took a picture of the thermostat at night and it was at 95 degrees. it cooled down in the morning and the thermostat said 70. there was only one bedroom with screens on the windows so that we could open them at night for a breeze and we let our two-year-old sleep in there so she wouldn't overheat. we suffered in another bedroom with three fans going that did nothing to cool the room. the four windows in the living room are old and non-functional and do not open. there really should be a warning in the description about the inside temperature of this cabin during a heatwave. or at least update the windows to have screens so you can open them at night without letting bugs in. we left a day early and they at least refunded our money for that night. Thank you for the review and feedback Nina. It was pretty darn hot, and we're sorry you could not enjoy your stay more. We LOVED this place. It was the perfect weekend home to celebrate a birthday with six women. We stayed three nights Memorial Weekend. The home is big enough to relax in for a good portion of the day - otherwise be sure to head to the river and float in a tube for a couple hours. The beds were comfortable, the kitchen is big enough to cook and had plenty of dishes, utensils etc. We roasted smore's in the backyard and did some yoga on the large deck in the morning. During the day we walked to downtown, hung by the river and went on a lovely hike to Armstrong Redwoods State Natural Preserve. I strongly recommend booking this ASAP and staying for a weekend! "The remodeling of this home was absolutely beautiful"
There were no features in this home That were Standerd everything was above expectations. The furniture was Akea. I wouldn't put anything more expensive in a rental either. Would 100% recommend Rumour as it as a great place to stay. We had an amazing time there, the deck outside is great for sunny days and the interior is a great size and space. You are only a short drive from the coast and the stunning Armstrong Redwood national park. We will definitely be coming back to the Russian River valley very soon! Accurate listing, cozy, convenient. The check in process was seamless (despite the Sunday/ "after-hours" check-in we required). Nice, quiet place to relax with family and experience the rain, lush foliage, trees, (nearby) ocean, and overall "quaintness" of Guerneville. I would recommend this place to others and plan to come back. 'RUMOUR HAS IT' was the most beautiful little house that was absolutely perfect for our needs. We had a family getaway with adult children. We sat by the fire and played cards, walked into town for coffee and drinks, and enjoyed the kitchen to cook our evening meals. We were centrally located to go wine tasting, visit Bodega Bay, as well as hikes in the beautiful Redwoods. It truly was a home away from home, and the whole process was so simple from start to finish. Thank you, River Getaways! We've rented w/ Russian River Getaways many times over the years, and this was one of our favorites. We felt comfortable from the moment we walked in the door. Not too crowded in among neighboring houses. House is very nice and remodeled with a quick trip to downtown. The neighborhood is a little rundown with anarrow lot line and the "river" access is more like a steep mud trail to a slab concert embankment. For the price it's great though! 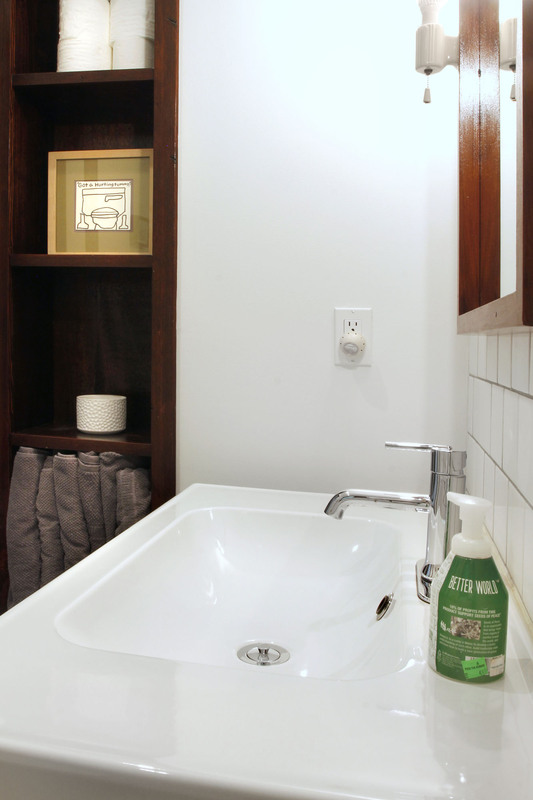 The bathroom was very nicely done and the stereo sounded amazing. 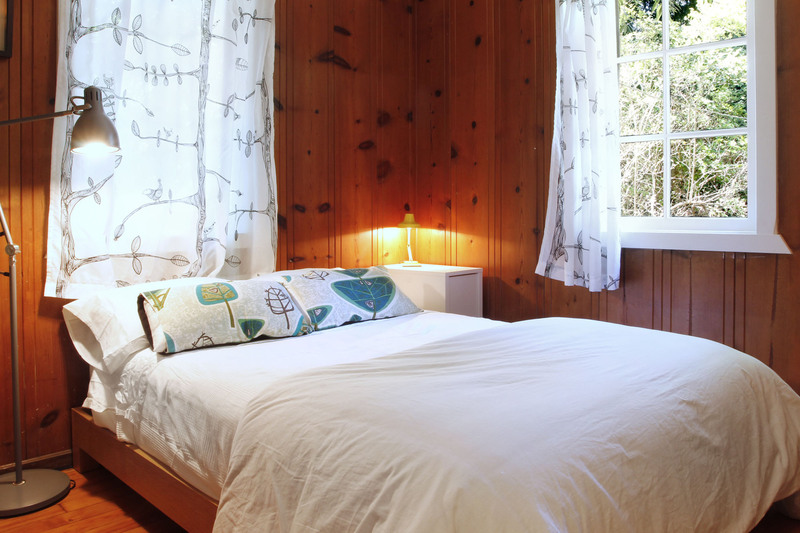 We had a wonderful time relaxing at this cozy cottage in the redwoods. Excellent location to visit wine country and the ocean - all in one weekend! Plenty of room for us and our two adult children. Nice updated kitchen and large deck to enjoy beautiful weather. Guerneville is close by with a supermarket for food and beverages. Rental was quick and easy and key pickup/drop off went just as described. Would definitely stay again! Wonderful house, great location to downtown. Nestled in the woods but still close to everything. Accurately described in Airbnb and check-in/check-out was super easy. Definitely rebooking in the future! We enjoyed ourselves very much and the hike over the bridge to downtown was beautiful. The house was charming. The house was just as promised. All was clean, neat and orderly. 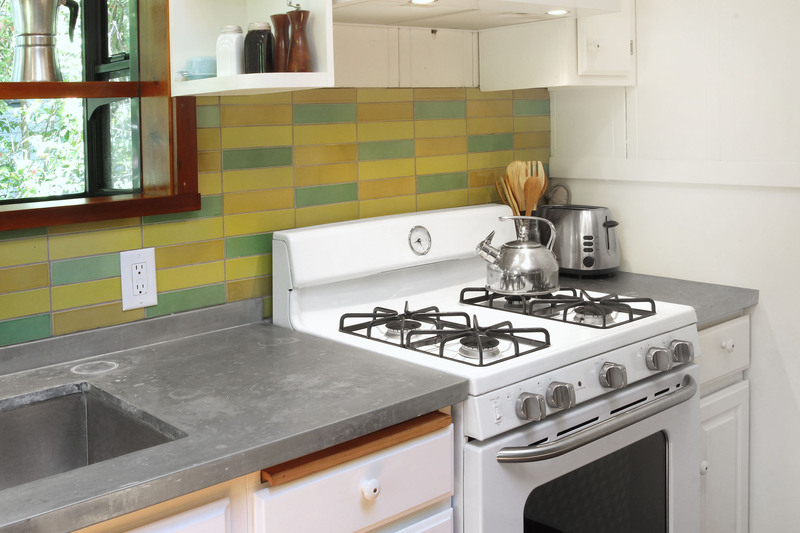 Plenty of dishes, pots and pans in the kitchen with dish towels and utensils. Great for preparing dinner, breakfast and snacks. The beds were comfy and the house was well furnished. 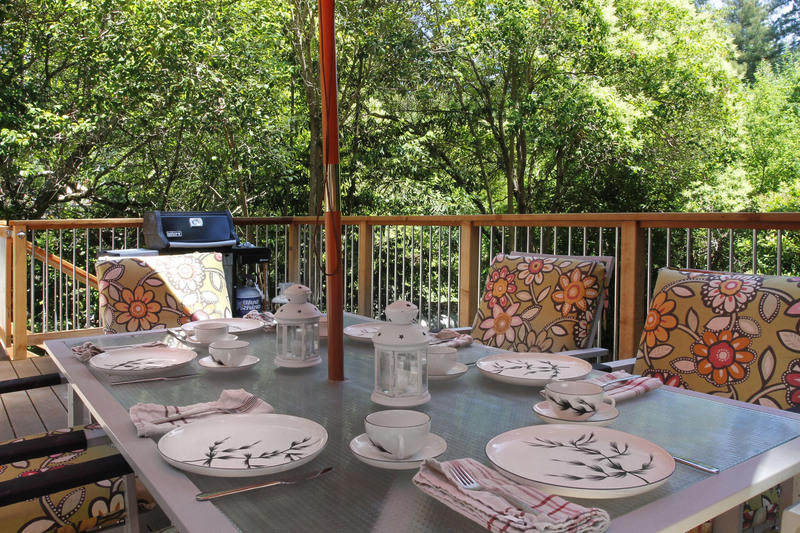 We particularly valued the table and chairs on the back deck - we spent most of our meals out there. Everything seemed to be well maintained. And it is in walking distance to town which is a particular treat! Picking up and dropping off the keys were a snap and all in all, we had a great time in Guerneville, in large part for this wonderful rental. "Rumor has it was the perfect spot..."
Rumor has it was the perfect spot for a girls get away weekend, near Sonoma. It was a quick jaunt to wine country, the ocean, Russian River or the red woods. The cabin was lovely and accommodated six friends very well. Indoor and outdoor spaces were well decorated and comfortable. Thanks for the great stay!! Enjoyed our stay at rumor has it! Very comfortable open floor plan that opens to a large deck. 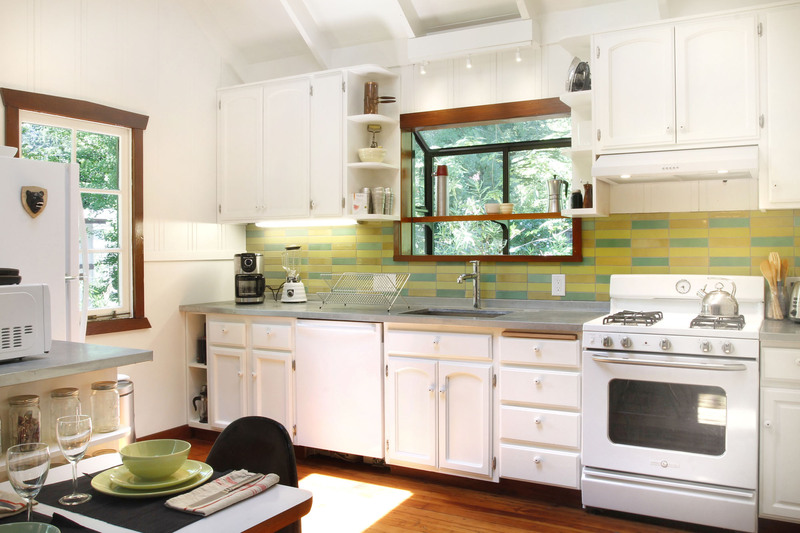 Very well decorated, and the kitchen was fun to cook in. I would definitely stay here again! "Such a beautiful cottage! " Such a beautiful cottage! The way it was decorated and restored was so charming. It was a great space to hang out in and perfect for 3 adults and 2 kids. The balcony is gated so very kid friendly. They loved playing in the yard as well. Check in/out was easy and we could walk everywhere. We would definitely stay here again! We had a great time. Nicely updated and kid friendly. "Nice place. Our family enjoyed our get together there." Beds are comfortable. We had plenty of room to hang out in the living room and out on the deck. We had 5 adults in our group. We had a great time on our low key bachelorette weekend. So comfortable, gorgeous back yard, and a really well stocked kitchen. "Great place - good location"
Great place - good location (just a 10min walk to the main Guerneville strip), plenty of outdoor space and interior was cosy and comfortable. 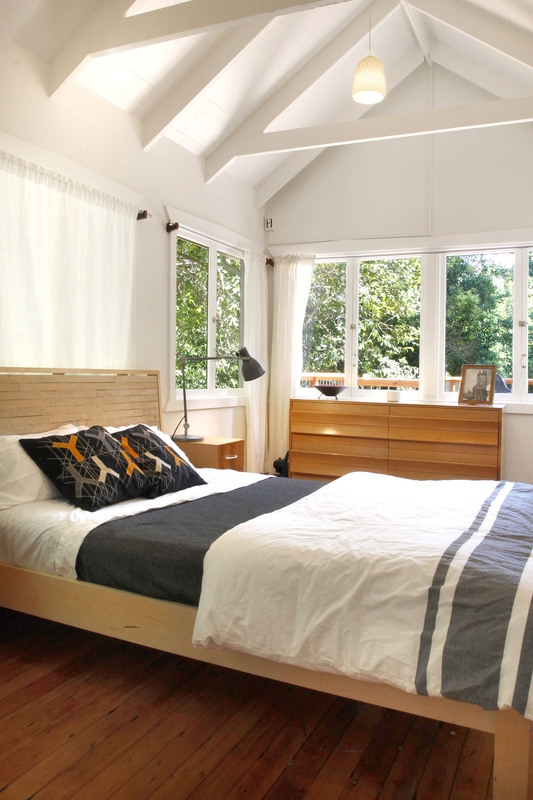 Despite the rainy weekend in Guerneville, this home was perfect for a family weekend. Beds were comfortable, the kitchen was well equipped and the bathroom was clean and newly renovated. We were a short walk from town as well as the park next to the Russian River. Had it not been so rainy, we would surely have enjoyed the spacious porch out back! This is a lovely spot for a family getaway. This house is awesome! I went with two friends for a girls weekend and it could not have been more perfect. It is very well designed throughout, with unique accents everywhere you looked. 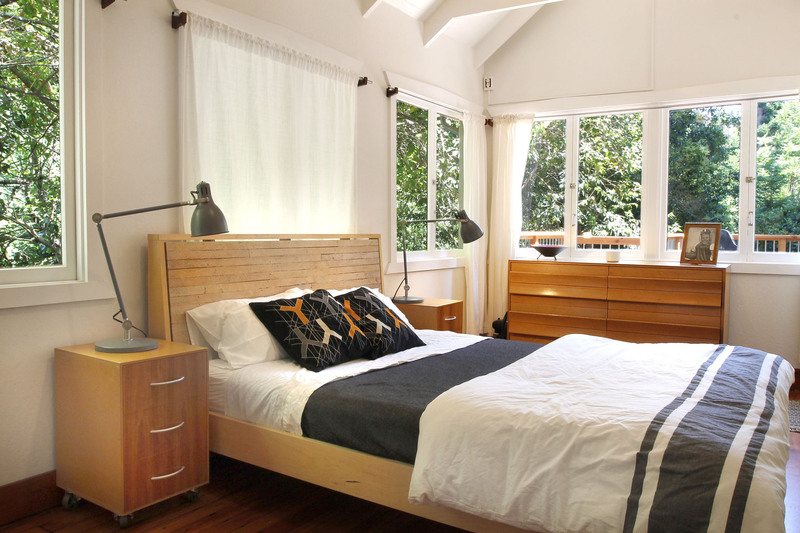 The space is really cozy and very comfortable with 3 separate bedrooms and an open living/kitchen area. Plus the outdoor space is huge! We arrived after hours and picking up the keys was easy. There was plenty of information in the house about how to access and run everything we needed. The house is about a 5-10 minute walk from town. 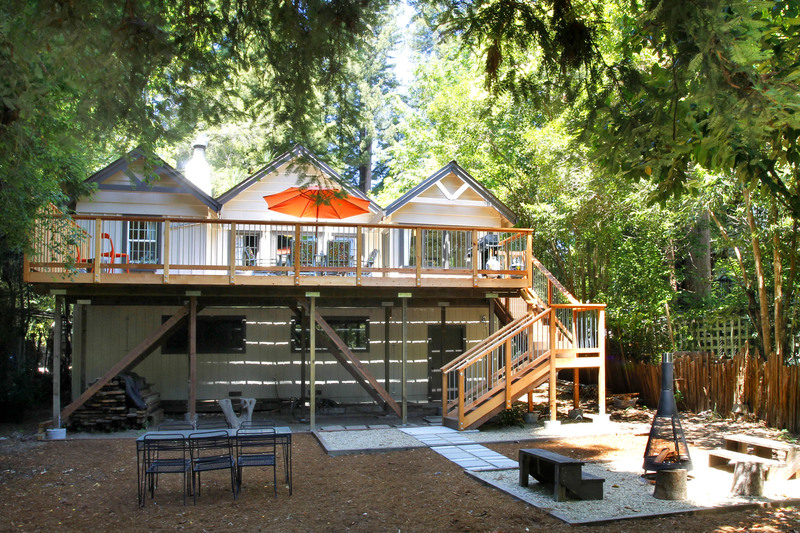 I love Guerneville and got married there a few years ago so I had high expectations and this place exceeded them! We will definitely go back! Rumour Has It was just like it was in the pictures; clean, comfy, and well kept. Loved the fireplace, kitchen was spacious and the master bedroom was a good size. The bathroom was spa-like, nicely done. The backyard was large, with a huge deck - which we didn't really use since it was cold this time of the year. The only thing I'd note was that it was a little cold inside but each room had a space heater and the fireplace kept the place manageable. It's not very secluded, so if you're looking for a private getaway, I wouldn't call it that. It's on a street with lots of homes but there was some privacy with the gated backyard and the tall trees. Close to town & river. Definitely would come back! 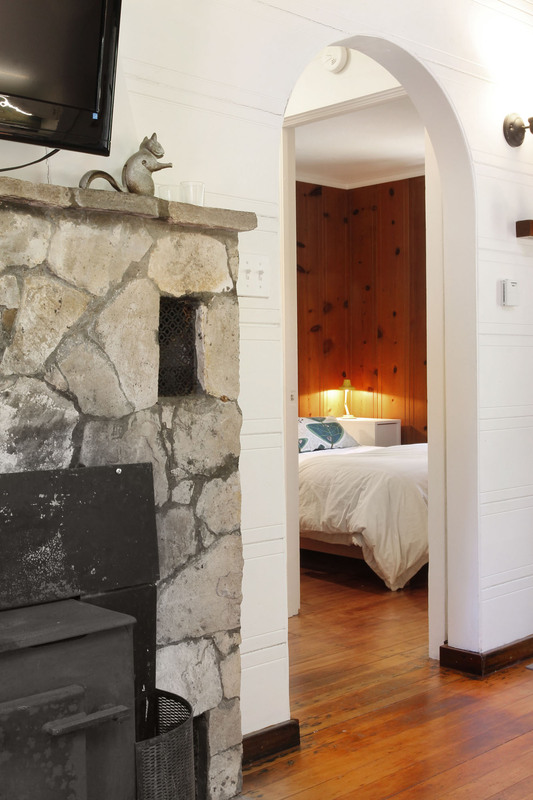 This cabin has period charm with a nice, modern design. We needed three bedrooms for our family and the set-up worked perfectly. The neighborhood is perfect. 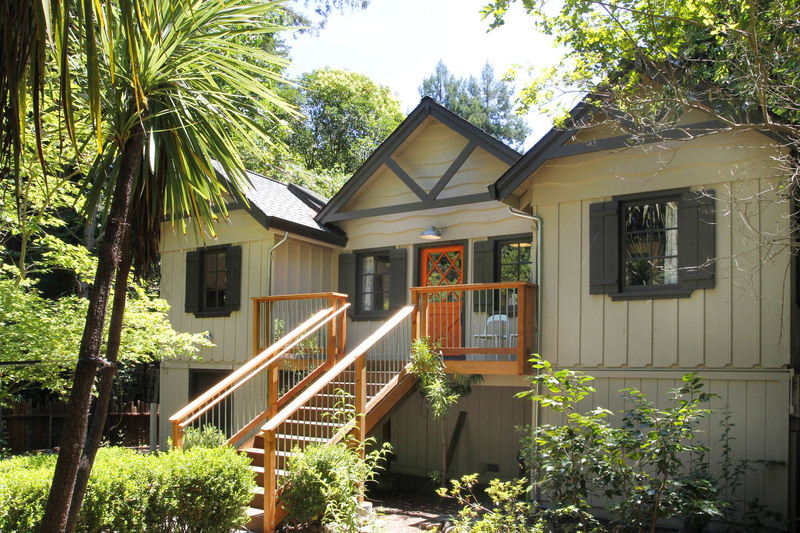 You can easily walk to downtown Guerneville, which we did frequently. Also, there's a small easement so you can get to the river for boating/floating. 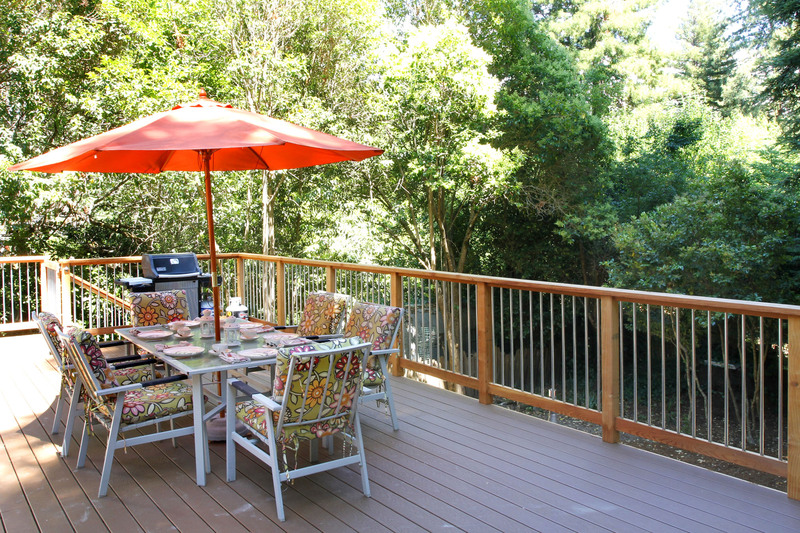 The huge outdoor deck was a great feature and we loved the grill. No complaints at all. This is one of our favorite cabins and we will be back!